When I was growing up my mom would limit our sugar intake…she wouldn’t buy the sugary cereals we wanted and we were only allowed to drink soda on the weekends. At the time I didn’t understand why she did that and quite honestly, I don’t think she knew the full story about sugar back then. It wasn’t until seven or eight years ago that I started to learn more about the way it was made and the hidden dangers. Thanks, Mom for being ahead of the game! Years ago I eliminated refined sugar (white and brown) because not only was the process to make it horrifying, but it has zero nutritional value. “It’s heated to boiling at least three times, treated with chemicals, filtered through bone char (powder made from cow or pig bones) and forced to crystallize.” (http://healingvibes.com/healingarticles/the-most-toxic-food-you-can-eat) Well, then I made sure to only use or buy raw sugar or evaporated cane juice….until I found out that while not as much as white sugar, raw sugar is still refined. Now what?!? It wasn’t that I needed sugar, but every now and then I craved something sweet, so I started using date sugar, raw agave nectar, coconut nectar, and pure maple syrup. Over the past year, I started using other natural sweeteners…but before I get into them, let’s talk a bit about glycemic index. Glycemic index (GI) is a measure of how fast a food will raise your blood sugar level. The lower the GI rating, the slower the absorption process, which provides a gradual release of sugar into the bloodstream. 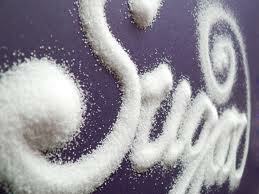 High GI ratings cause glucose and insulin levels to spike, which may lead to weight gain and diabetes. Palm Sugar – (GI rating 35) comes from the flowers of coconut trees. The nectar is air-dried to form crystals which are naturally brown in color and rich in vitamins. Palm sugar is loaded with potassium, magnesium, zinc, iron, vitamin C, and many of the B vitamins. It has a caramel sweetness, reminiscent of brown sugar. 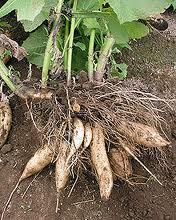 Yacon – (GI rating 0) a potato-like root vegetable that is a relative of the Jerusalem artichoke. Can be turned into a powder or syrup to offer a slightly sweet sugar substitute. Yacon contains potassium, calcium, magnesium, antioxidants, and vitamins A, C, and E.
Stevia – (GI rating 0) contains zero calories and zero carbohydrates too! 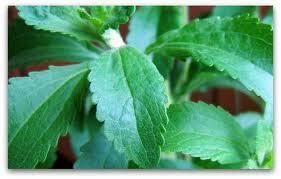 Stevia is a herb in the sunflower family. The ground leaves are 300 times sweeter than sugar…so you only need a pinch of powder or a drop or two of liquid. It is super sweet and too much can leave you with a bitter taste. You want to avoid the white stevia powder as it is processed so look for the raw natural green stevia. Coconut Sugar – (GI rating 35) high in potassium, magnesium, zinc, and iron and a natural source of vitamins B1, B2, B3, B6, and C, organic coconut sugar is unprocessed, unfiltered, and unbleached natural sweetener. Coconut Nectar – (GI rating 35) contains 17 amino acids, minerals, vitamin C, B vitamins, and has a neutral pH. It is raw, made in small batches, and minimally evaporated at low temperatures. Maple syrup – (GI rating 54) use the PURE stuff! Stay away from the imitation syrups such as Aunt Jemima, Mrs. Butterworth, and others as they contain corn syrup and artificial flavorings. 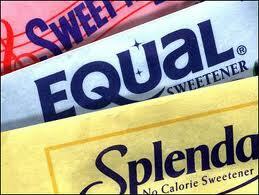 The great thing is that you can find the raw natural sweeteners I discussed above in your local health food store! The artificial junk and regular sugar do not provide ANY nutritional benefits…if you’re going to eat something sweet, it might as well be good for you too!